Public Health Renegades Hackathon was a weekend long innovation competition to design and build technology tools that respond to specific community needs related to public health. This interdisciplinary competition engaged students and professionals from various backgrounds in Science Technology Engineering and Mathematics (STEM) and non-STEM fields, local centers of higher education, community and industry partners, and the public. The goal is to increase awareness of public health and use technology tools and collective expertise to address public health issues. This event was an innovation competition brought to you by the KIT Community and CSU Bakersfield to develop the best technology tool to help with library efficiency and patron access in Kern County that responds to specific needs of local libraries and the community. Libraries are a place of accessible knowledge, opportunity, and history; a valued community resource. They can also be a place of invention and technology. 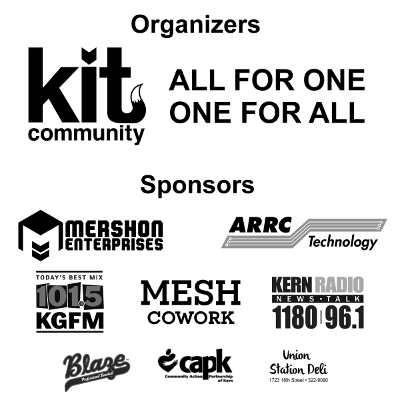 The KIT Community and CSU Bakersfield invite you to compete to develop needed technologies to help the local libraries better serve the community. This competition was open to all professions and experience levels. Teams were formed at the event Friday night and worked out innovations throughout the weekend. Students in the fields of computer science, engineering, business, education, and humanities were strongly encouraged to compete. 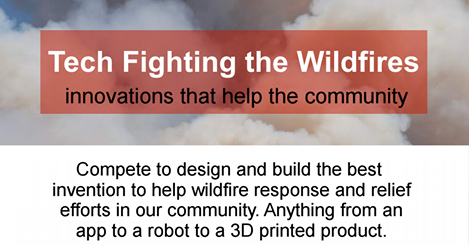 Technology Fighting the Wildfires (Tech FTW) was an innovation competition hosted by the KIT Community and the All for One Movement on August 5-7, 2016 to develop the best technology tool to help with wildfire response and disaster relief in Kern County that would respond to specific needs of the affected communities and those trying to help them. The Erskine and Deer fires recently have greatly affected our communities and caused many residents to suddenly find themselves without a home and in need of help. This competition was open to all professions and experience levels; the only requirement was compassion. Teams were formed at the event Friday night and worked out innovations throughout the weekend. MESH Cowork was available for teams to work. Teams were judged on how well the technology tool fit a community need and how well the prototype for the technology tool was built. PRIZE: The winning team, Beacon, won a trophy and cash prize. This event was sponsored by these local businesses and organizations: KIT Community, the All for One Movement, Mershon Enterprises, ARRC Technology, MESH Cowork, KERN 1180, KGFM 101.5, iSafety Pro, Community Action Partnership Kern, Union Station Deli, Bakersfield Blaze, Creative Cowork, Ponce de Leon Enterprises, Mantis Energy Drink, and IDI-Tech. For more information on how you can help those affected by the Erskine Fire, please visit the All for One Movement Organization website at http://www.allforonemovement.org/. All paid ticket proceeds went towards food, refreshments, and organization. The other half of raffle proceeds went to the All For One Movement to aid in their efforts to help victims of the Erskine Fire. Want to bring the KIT fox to your class? Post to Facebook or Instagram using the hashtag #classroomkit and why you want to bring the KIT fox to your class. If your post gets 20 or more likes, the KIT fox will visit your classroom and present about technology and entrepreneurship. Promotion ends June 10, 2016. School must be located in Kern County. Organized home school groups of 10 or more students are also eligible. The KIT fox visit will depend on teacher approval. Compete to create a cool innovation for bars, breweries, vintners, distilleries, and alcohol safety. Use your engineering, software, business, marketing, or personal experience to revolutionize alcohol in Bakersfield! Participants formed teams at the competition and worked out innovations in a crazy wild weekend marathon of inventing. Teams were judged on basic prototype, basic business plan, presentation, and overall awe factor. PRIZE: Winning teams won a super awesome prize including cash or gift certificates and an official award trophy. All participants will get cool swag/promotional items and a participant packet. Some food will be provided. Must be 21 or older to compete. If you have any questions, send an email to kerninnovation@gmail.com and use the subject "Distill Your Idea". Interested in volunteering for or sponsoring this event? Let us know at kerninnovation@gmail.com. This event was sponsored by these local businesses: Mershon Enterprises, MESH Cowork, Creative Cowork, Idea Tailors, Temblor Brewing, Chickadee Entertainment, and Mantis Energy drink.